After the release of Anita Rau Badami's critically acclaimed first novel, Tamarind Mem, it was evident a promising new talent had joined the Canadian literary community. Her dazzling literary follow-up is The Hero's Walk, a novel teeming with the author's trademark tumble of the haphazard beauty, wreckage and folly of ordinary lives. Set in the dusty seaside town of Toturpuram on the Bay of Bengal, The Hero's Walk traces the terrain of family and forgiveness through the lives of an exuberant cast of characters bewildered by the rapid pace of change in today's India. Each member of the Rao family pits his or her chance at personal fulfillment against the conventions of a crumbling caste and class system. 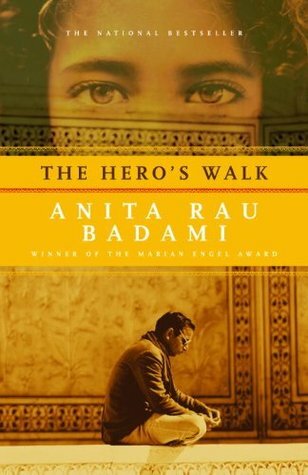 The Hero's Walk is a story about a father, Sripathi, who disowns his daughter, Maya, after she chooses to break an arranged marriage and instead marries a different man, a white man. The father and daughter are not given the time to reconcile as Maya and her husband die in a tragic car accident years later. Their daughter Nandana, fortunately, was not in the car with them. Nandana is left in the care of her estranged grandfather who has travelled from India to take her home. Throughout the book we learn of Sripathi's struggles with his ailing mother, his sister, his wife and his son. Each of them feels that he has wronged them at some point in their life and is to blame for their misfortunes. He is also now left to care for his grand daughter who knows nothing of this new and, yet, backwards country. As time goes on, Sripathi and Nandana begin to form a bond and he is given a second chance to mend the bond that was torn between him and his daughter so many years ago. Sripathi's story is one that I truly enjoyed. Where I think some readers may have a challenge with this book is its cultural aspect. With over 95% of the book being set in India, readers are immersed in a culture which may be unfamiliar to them. Though the various aspects may be foreign to some readers, I think it adds to the overall experience of the book because you are able to empathize with Nandana. For readers who stick with it, you will find a story filled with love, heart ache and second chances. The Hero's Walk is being defended by Vinay Virmani. Vinay is a Toronto native with a background in writing and acting. I think Vinay has an opportunity to go very far in this competition if he focuses on the books underlying themes of starting over and getting second chances.